Japan commemorated the 70th anniversary of its surrender to end the Second World War on Saturday, with a minute's silence at a memorial event attended by the emperor at the controversial Yasukuni Shrine. 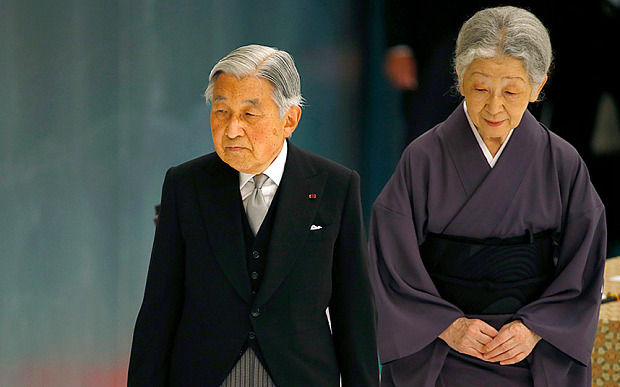 Emperor Akihito told a gathering at the Nippon Budokan Hall, attended by around 5,000 relatives of victims of the conflict, that he felt "deep remorse" over the war. Shinzo Abe, the prime minister, said that force should never again be used to settle international disputes. "As we mark the 70th anniversary of the end of the war, we pledge never to repeat the horrors of war, to carve out the future of this country for the sake of the generation that is alive at this moment and for the generations of tomorrow," he said. 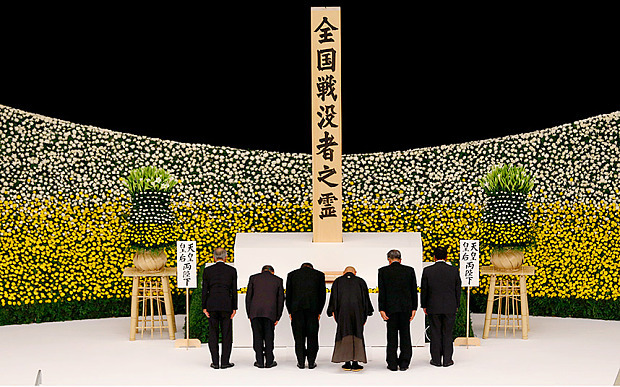 The minute's silence at midday came at the precise time that a recorded address by the Emperor Hirohito, the present emperor's father, was played over the radio in 1945 and requested that the Japanese people "endure the unendurable" and accept the nation's defeat. 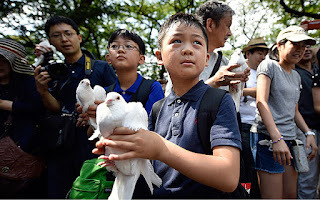 The ceremonies in Tokyo came a day after China and both South and North Korea criticised a statement on the anniversary by Mr Abe for failing to include a personal apology to the people of nations that were invaded and occupied by Japan in the early decades of the last century. Media in South Korea also claimed the statement "lacked sincerity". They were quick to criticise Mr Abe for sending on Saturday a ritual offering to Yasukuni Shrine, which honours Japan's 2.4 million war dead but also, controversially, 14 Class-A war criminals convicted after the war. 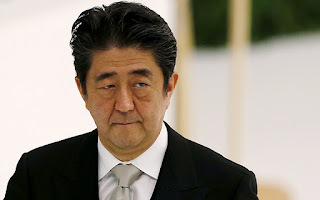 Three members of Mr Abe's cabinet visited the shrine on Saturday, along with more than 100 other politicians, further angering Japan's neighbours. 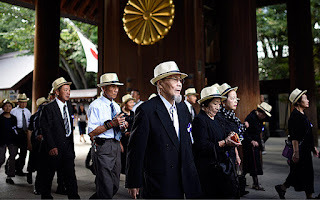 They received warm rounds of applause from the people paying their respects at the shrine, who ranged from frail-looking veterans and small groups of elderly women dressed all in black, to families, groups of men in wartime uniforms and bands of nationalist groups. In uniforms of shaven heads, coveralls adorned with rising sun badges and jackboots, the groups marched forward to pay their respects in front of the main hall of the shrine, led by a standard bearer with the Japanese flag. "I've been taking part in counter-demonstrations against the protest marches against foreigners that have become quite common in the last few years and I see many familiar faces here today," said Kenichiro Ito, a doctoral candidate at Kyoto's Ritsumeikan University. Mr Ito believes that it is important for the Japanese people to have a place where they can remember their war dead, in the same way that Britain remembers the men and women who died in wars at annual Remembrance Day events, he said. The problem is that Yasukuni Shrine has been "stolen" by those who want to politicise the nation's history. "We have to have a healthy, responsible national pride that also accepts the faults of the past," he told The Telegraph. "But Yasukuni has been turned into a political place where propaganda is more important than the past."